During the holidays, we always end up eating out more than usual. Between holiday parties, shopping trips for gifts and tons of work to get done before vacation, making dinner at home and even grocery shopping becomes harder. But now, it is time to get back on track! 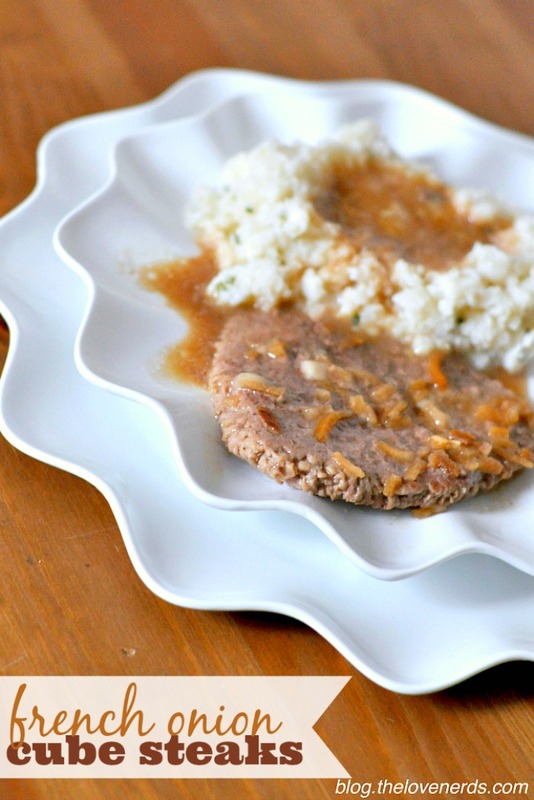 So last night, I cooked up one of my favorite winter meals – French Onion Cube Steaks with Gravy. I love these cube steaks because meal prep is quick and the house smells amazing while they are in the oven. I was salivating all afternoon, and the first thing Bryan said when he walked in the door was “it smells amazing in here!” There is just something so comforting in the winter about a warm meal cooking in the oven, making the whole house smell amazing. Makes the house feel loved! Plus, it only takes 5 ingredients to make this dinner, and water is one of them! Making more meals like this is a 2015 goal of mine because they usually mean quicker dinner prep on a weeknight and they are friendlier on the budget. Cutting back on the food budget can make a big impact on the bottom line. 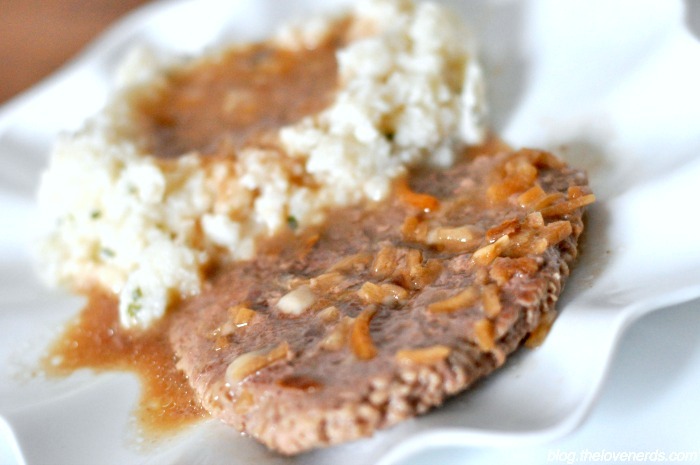 An easy 5 ingredient dinner idea that will make your house smell amazing - French Onion Cube Steaks with Gravy! In a casserole dish or a deep oven-safe bowl, mix together all ingredients except the cube steaks. Place the cube steaks into the soup mixture, submerging them as much as possible into the mixture. Bake covered at 325 for 2 hours. Remove when done and enjoy! I hope you all enjoy! It’s a great dinner idea to add to the meal plan that I talked about yesterday in my 7 Tips for an Organized Life (with Erin Condren giveaway until 1/12).